Life is full of challenges that can be damaging to the human soul. Some challenges such as broken relationships and disease are internal. The restoration of the soul may take a long time or there may be a quick resolution. Other life challenges are caused by an external force of nature such as a hurricane. Healing from internal and external forces may be accomplished through art. Art expresses who we are as individuals. For many people internal life challenges may be healed through music, writing, or painting. Art is like a magnet that expresses our innermost thoughts and feelings. In many ways art will imitate the journey of our lives. The Mississippi Gulf Coast is a beautiful nature scene. There are beaches filled with birds and people. Each enjoying the abundance of sunshine, sand and water. The Mississippi beaches feature restaurants, picnic areas, and water vehicles for rent. There are piers where people can fish. Fishermen can be seen early in the morning walking to their favorite spot. Beautiful sunrises and sunsets may be enjoyed from many spots along the coastline. The beauty of the Mississippi Gulf Coast is expressed in music venues, art museums, and paintings. All is well today but more than ten years ago a devastating hurricane came ashore that changed the journey of life for people and nature. Hurricanes are a frightening force in nature. The force of the wind and water causes much damage and pain to all things involved. Hurricane Katrina caused devastation and death along the Mississippi Gulf Coast. The tranquil and comfortable lives of people were devastated in a few days. People fled to the north to escape the dangerous gulf surges, tornadoes, and winds. Upon return to the south the land mass between Louisiana and Alabama would never be the same. After the hurricane people came back to a desolate environment. The homes and businesses of the Mississippi Gulf Coast were either destroyed or heavily damaged. The once beautiful beaches were covered in rubble from buildings. The forces of the gulf water surge destroyed the natural environment. There would also be death surrounding the survivors. Some people refused to leave their homes and died in the rising waters. There was great despair in many parts of this area. Hope began to rise in the destruction as Mississippi Gulf Coast residents returned to rebuild. The work was hard and the days were long but the people were persistent. Over eleven years have past and the Mississippi Gulf Coast has recovered and is growing once more. During the rebuilding years many artists have used the devastation and rebuilding process as inspiration. There are paintings, sculptures, and music to reflect the healing of the times. This artwork is displayed in many venues. There are museums reflecting the culture of the people. The healing of this devastation has taken years to accomplish. In the mist of the destruction some artists have taken some creative steps to create beauty out of the devastation on the scenic highway 90. Prior to Hurricane Katrina the median along highway 90 in Mississippi was filled with live oak trees. These beautiful trees were tall and commanding along the coastline. For many years these trees stood as a reminder that nature once stood guard against the storms. These live oak trees also served as a postcard to years past. Some artists decided to create sculptures out of the dead oak trees now scattered along highway 90. Taking chain saws these artists created art out of the devastation. The sculptures now replace the oak trees in the median of highway 90. Each day people traveling highway 90 look upon the beauty of these sculptures. The sculptures are a postcard to the past and present. They are a reminder of how new life can spring from extreme devastation. Many of the sculptures use the subject of marine life. Several of the sculptures have pelicans and other coastal birds as subjects. Each appears to tell the story of nature along these coast lines. The beaches and gulf waters of the Mississippi Gulf Coast have been repaired. 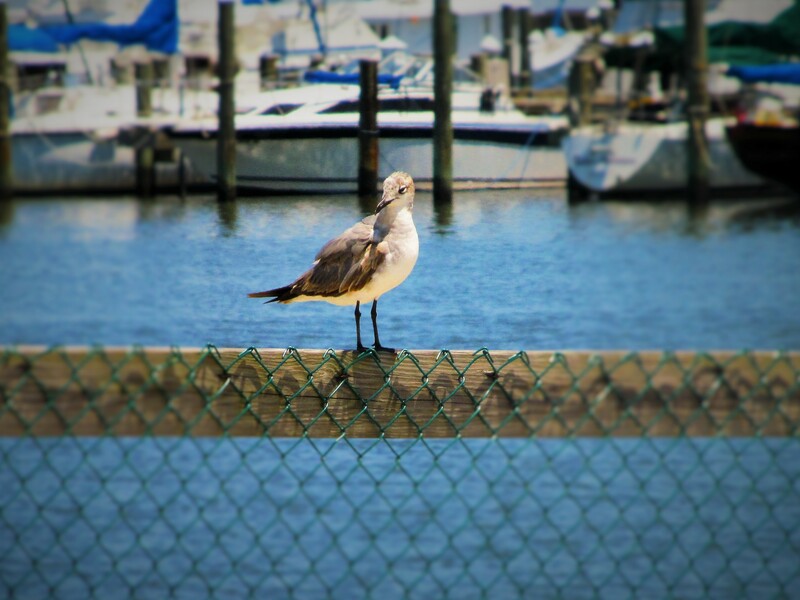 The coastal birds and marine life are wonderful to observe and photograph. The old pier posts are filled with pelicans and other birds. It fills the soul with a sense of peace observing these birds splashing in the water and enjoying the day on the pier post. The Mississippi Gulf Coast if an example of how life changes have a positive influence on the soul. The art that is exhibited in the museums, highway 90, small shops, and in music venues shows the spirit of renewal after a time of devastation. Truly it is a lesson for all of us. It is well within the soul. Hurricane Katrina, oh that reminds me of New Orleans. Despicable response by authorities.. Glad there emerge post now and then which teach of human spirit. Thanks for not letting us forget. Good no Great post.. Thank you for your kind words. The human spirit is a wonderful thing. Thanks for reading. Beautiful post, and yes, important lesson too. hmmm, “how new life can spring from destruction”. That says so much, literally and figuratively. Attitude is everything. This is a beautiful “memorial” for locals to cherish and to share it’s story with visitors. I know if we head that way again, we WILL be sure to travel Hwy 90. Thank you for your kind words. There are many beautiful art memorials along Hwy 90. Thanks for reading. A heartwarming post. Several years ago, we visited New Orleans, for me a return as I am a graduate of Tulane class of 62. Yes, reminders of Katrina were still there. We drove through the lower ninth, still not really recovered, a mix of lingering devastation and re-building. But we were impressed by the vibrancy of the people, their optimism and love of life, even though many lived in so-called poverty by the official standards. And the food was incredible. The Brennan’s etc. are above our pay grade, so we ate in the “everyday” restaurants, after soliciting local recommendations. I asked one hotel worker, a black man, about his experience with Katrina. He said that it produced both good and bad. An uncle had been killed. But for many persons the aftermath offered a new beginning. For some that meant re-location, for them a positive move, to cities like Houston. Thank you for your kind words. I admire the courage and ability of the people who survived Katrina to rebuild. New Orleans is a wonderful and magical place. Thanks for sharing. Thanks for reading.